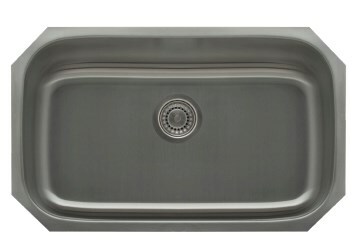 The PL-VS3218 single bowl undermount sink is constructed with 304 Series stainless steel. 304 Series of “surgical grade” stainless steel is nonporous, hygienic, rust free and extremely durable. It has a satin brushed finish. The elegant finish creates an enduring easy-to-clean luster and is designed to conceal small scratches that occurred during normal usage. The bottom has a undercoating applied that is fitted with sound deadening pads. Both features help deaden sound attenuation and act to reduce condensation buildup on the bottom of the sink that could lead to moisture problems in the base of the cabinet that the sink is installed in.